When you have bulk mail to send to people on your mailing list, you can use mail merge to create a batch of addressed envelopes. Each envelope will contain an address in your mailing list. 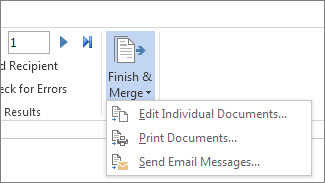 You can also create and print envelopes without using mail merge. This document contains text and graphics (a logo or an image, for example) that are identical for each version of the merged envelope. The return address on the envelope is an example of identical content. This document contains the addresses to be printed on the envelopes. When you combine those two documents using the steps below you'll have your addressed envelopes. The mailing list is your data source. It can be an Excel spreadsheet, a directory of Outlook contacts, an Access database, or an Office address list. It contains the records Word pulls information from to build the addresses to be printed on the envelopes. If you don’t have a mailing list, you can create one during mail merge. Before you start the mail merge process, collect all of your address lists, and add them to your data source. 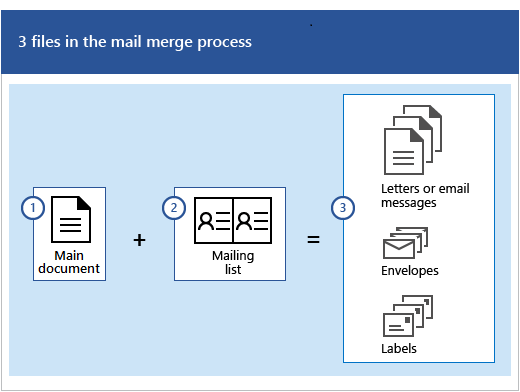 A preliminary step in the mail merge process is to set up the envelope for the merge. It's always a good practice to run a small test batch of envelopes before you do a real mail merge. Note: If you're comfortable with printing envelopes on your system you can skip to step 3. On the Mailings tab, in the Create group, choose Envelopes. In the Delivery address box, type a sample address to test how an envelope will look when it's printed. Note: The sample address won't show up in your mail merge. 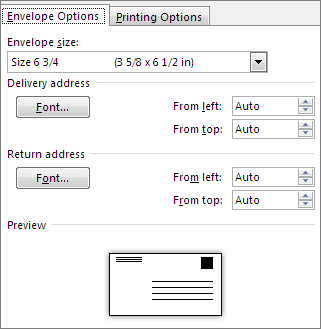 In the Envelope size drop-down list, choose the size that matches your envelope or choose Custom size. Note: If you choose Custom size, enter the envelope dimensions in the Width and Height boxes. Choose OK when done. Under Delivery address and Return address, choose a font and the left and top offset position for each address. Note: Based on the preview of the envelope layout, make any necessary adjustments to your choices. On the Printing Options tab, confirm the correct Feed method is selected, load the envelope to match the illustration, and then choose OK. Note: Your printer sends Word information about which way the envelope should be loaded in the printer. This information appears under Feed method. 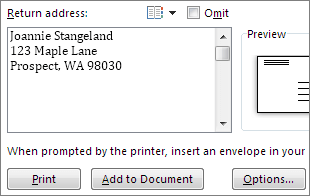 Choose Print, and then choose Yes to save the return address as the default address. Note: If the envelope printed correctly, congratulations, you're ready to go to the next step in the mail merge process. If the envelope didn't print as you expected, go back to step 5 and readjust the envelope layout options and the Form Feed options as necessary. On the Mailings tab, in the Start Mail Merge group, choose Start Mail Merge > Envelopes. In the Envelope Options dialog box, set up the envelope by choosing options as in Step 2: Test your envelope layout, and then choose OK. Note: Word creates a document that’s sized to the envelope dimensions and shows where the return address appears on the envelope. If you'd like to add a return address, or logo, to your envelope now is a good time to add that. Choose File > Save, and add a file name. Now you're ready to open the data source for your mailing list. If you’re printing envelopes for everyone on your list, go to Step 5: Add the address block to the envelope. If you want to print envelopes for people on your list who live, for example, within 20 miles of an event you're hosting, then use a filter like a ZIP Code or a postal code to narrow the list. 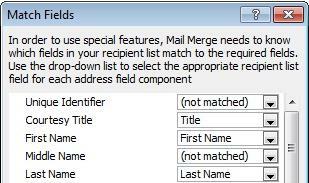 For more information on filtering your data see Sort and filter the data for a mail merge. Tip: You may find it useful to use the filter feature to filter out contacts for whom you don't have a postal address. That way you don't waste envelopes that you won't be able to mail. Check the names of the people who you want to receive your mailing. The address block is a mail merge field. Also known as a placeholder, you use the merge field to mark the place where you want addresses to appear on the envelope. Note: It's often easier to properly align the address block if you turn on displaying paragraph marks (¶) first. To turn them on go to the Home tab of the Ribbon and click the Show /Hide ¶ button or press CTRL+SHIFT+8. Place your cursor were you want the address block to go. If you have show paragraph marks turned on, click immediately after the paragraph mark (¶) that Word has placed in the middle of the envelope. 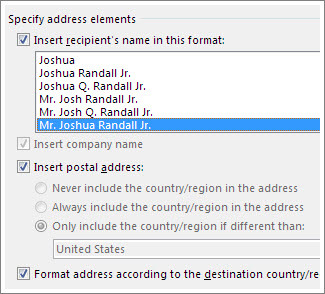 In the Insert Address Block dialog box, choose a format for the recipient's name as it will appear on the envelope. Note: Under Preview, choose the Next or Previous record button to move through records in your data source and view how an address will appear on the envelope. Choose File > Save to save your merge document before proceeding. Make sure Word puts the names and addresses from your mailing list in the right places on your envelope. In the Match Fields dialog box, the column on the left are the field names that Word uses in an Address Block. The column on the right lets you match up fields in your data source to those field names. Verify that the field names that appear on the left side match the names of column headings for records in your mailing list so Word can put the correct data in the correct place on your envelope. Do a final check before you print the envelopes. Choose Preview Results, and then choose the Next or Previous record button to make sure the names and addresses on all the envelopes look right. Choose Finish & Merge > Print Documents. 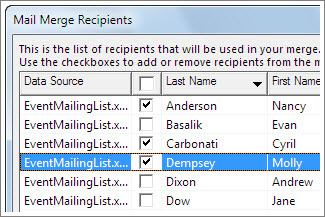 When you save the mail merge envelope document, it stays connected to your mailing list so that you can use it for your next bulk mailing. 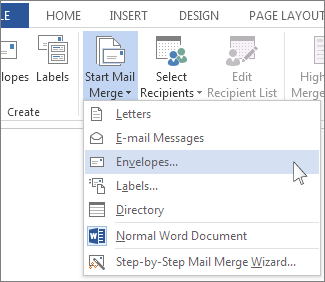 Open the mail merge document for envelopes and choose Yes when Word prompts you to keep the connection. 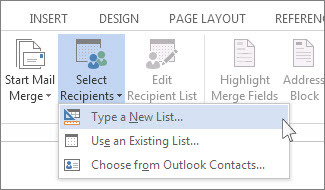 Open the mail merge document for envelopes and choose Edit Recipient List to sort, filter, and choose specific addresses. Mail Merge - A free, 10 minute, video-based training.